Forget Me Not Cottage and The Garden Suite are in Dukes Rd on the South East Corner of the City. Take Lake Albert Rd or Kooringal Rd to the lake , turn left and take Brunskill Rd past the lawn cemetary to Mitchell Road, turn right, Dukes Rd is the second on the left. The City Retreat is in Fitzmaurice St at the northern end of Baylis St, opposite the old bridge. Town and Country Accommodation Forget Me Not Cottages at Elm Tree Park offers 3 kinds of accommodation. Forget Me Not Cottage - has a queen sized bed and optional third bed, ensuite, lounge, kitchen, own BBQ area, air conditioning, etc. The Garden Suite - opened in January 06 this accommodation has a queen sized bed and a fold out inner spring sofa bed if required. Also, there is a kitchenette dining area lounge and bathroom with a two person spa for your comfort, own BBQ area. The City Retreat is situated in Wagga's CBD and includes two bedrooms with queen sized bed and two singles, a fully equipped kitchen, dining area and lounge with Austar TV, also included is a BBQ and outdoor dining area and undercover car park. 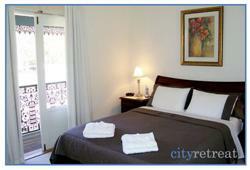 The City Retreat is a short walk from many of Waggas shopping,entertainments and restaurants. Forget Me Not Cottage is a fully self contained accommodation that is suitable for visiting business personnel, holidays and mini breaks, The Garden Suite is perfect for a quiet weekend away to kick back and relax with a glass of wine and spa. 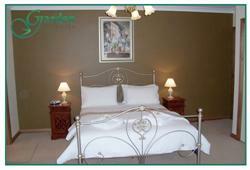 The City Retreat is designed to cater for visiting professional people, two couples or families. Being centrally located it is very popular for accommodation for the many events held at Wagga. Forget Me Not Cottage is a one of a kind accommodation in a garden setting with beautiful views on 20 acres just 15 minutes drive from the centre of the city. 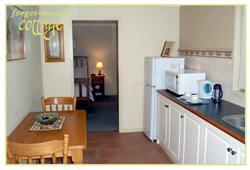 The accommodation is AAA 4 star rated and includes fine linen, towels and its own outdoor BBQ area. Book now to enjoy your stay for pleasure or business in your own unique cottage. The Garden Suite is ideal for secluded restful weekends away and wedding nights. Opened in January 2006 The Garden Suite is just 15 minutes drive from Baylis St and set in the Garden at Elm Tree Park the accommodation includes a queen size bed, ensuite with 2 person spa and kitchenette. Cancellations made in 7 days and less of the arrival date attract a fee of 100% of the value of the booking unless the dates are able to be rebooked. Cancellations made in 14 to 7 days prior to the arrival date attract a fee of 50% of the value of the booking unless the dates are able to be rebooked. Failure to arrive or or departure proir to the completion of the booking will incur a fee of 100% of the tariff.